This is a wonderful and hearty first course which showcases an assortment of spring vegetables with maximum effect. It’s perfect for company, since all of the components can be prepped ahead, then assembled and dressed at the last moment. Served at room temperature, it requires no last-minute reheating or fumbling with pots. Dandelion greens serve as the base for the salad. I use the leafy greens, slightly chopped, and save the stems for a later use. 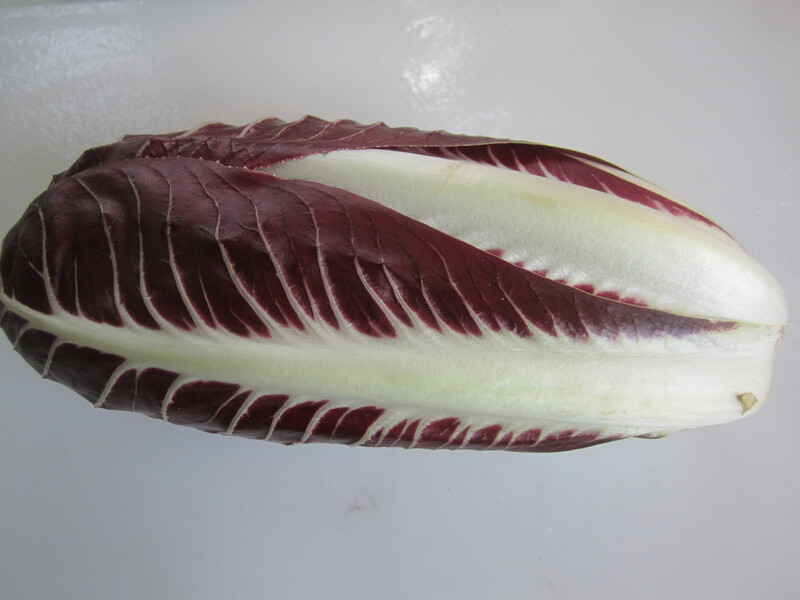 Along with the dandelions, is radicchio di Treviso, that torpedo-shaped crimson leaf with the white ribs and veins. 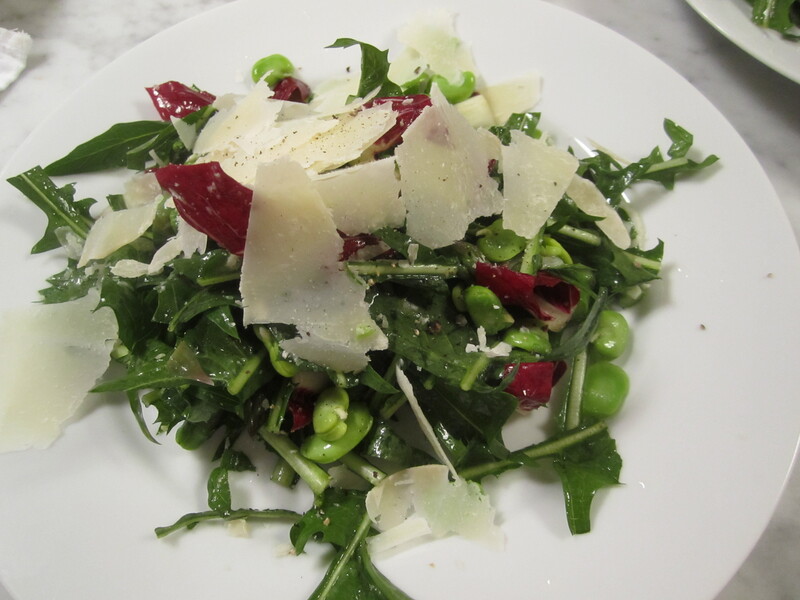 To counter the bitterness of the dandelion and radicchio, asparagus and fava beans add softness and nuttiness. These are both blanched ahead of time and held at room temperature until ready to assemble the salad. Shaved fennel adds a sweet, clean crunchiness to the mix. 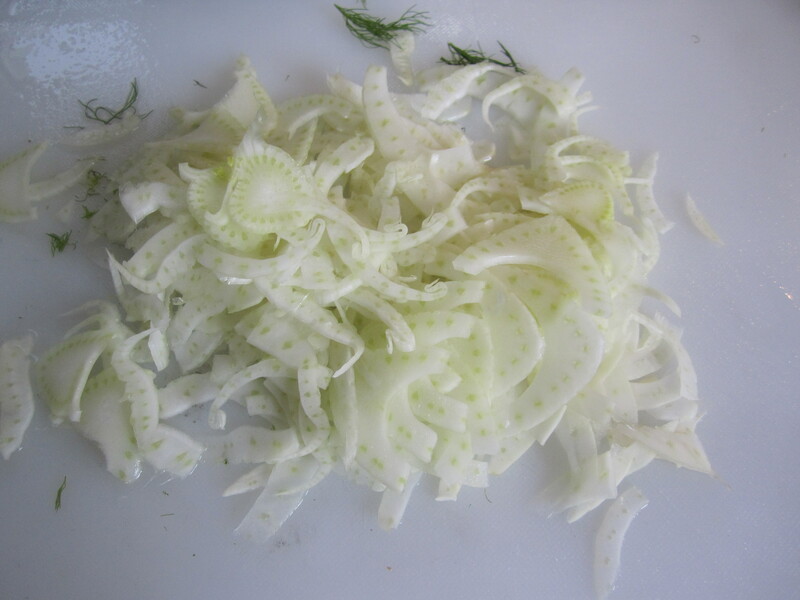 The bulb is trimmed of any thick, fibrous outer layers, then shaved on a mandoline. The shavings rest in a bath of ice water until ready to serve. 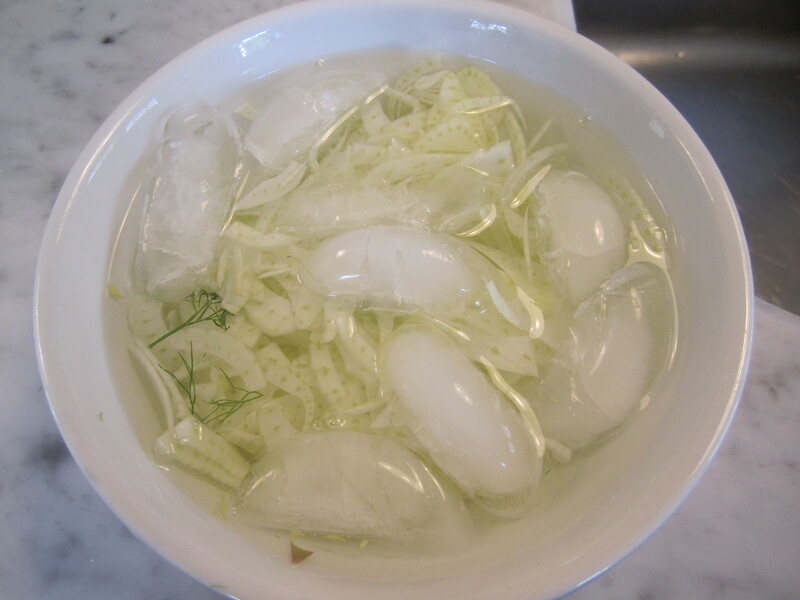 The ice water breaks down the toughness of the fennel and gives it a wonderfully crunchy texture, and mild flavor. Last but not least, pecorino sardo, if you can find it, is literally the crowning ingredient that unifies and tempers all of the ingredients. Also known as fiore sardo, it’s a sheeps’ milk cheese from Sardinia that is nuttier and milder than conventional supermarket-variety pecorino romano, but by all means, substitute pecorino romano, if you can’t find sardo. The dressing is a heavy dose of extra-virgin olive oil and lemon juice. A good amount is necessary to tame the bitter greens. Lots of salt and black pepper also bring the flavors to life. 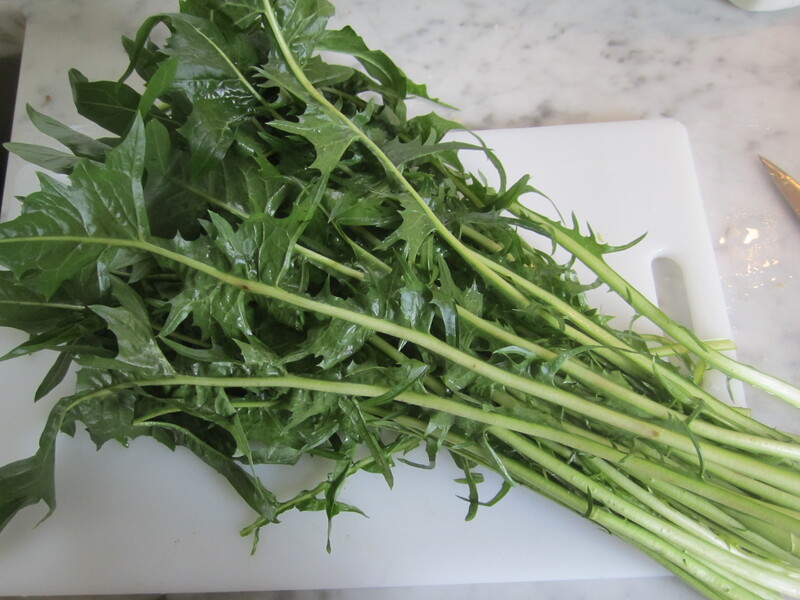 2 medium bunches dandelion greens, cut crosswise into 2″ lengths, bottom 4″ of stems removed and set aside for later use. 1 1/2 c fava beans, the yield from approximately 2 lbs of whole pods, shucked, blanched and peeled (see Fava Beans with Leeks, Arugula and Mint). Wash dandelion greens well by soaking a deep bowl of cold water, draining the water after each washing, until no more soil remains on the bottom of the bowl. Dry in a salad spinner and set aside. Snap off bottoms of asparagus by bending the spear in half and allowing it to break where it wants. Drop asparagus in small bunches into salted, boiling water and blanch for 1 1/2 minutes. Place directly into ice cold water for about 5 minutes to stop the cooking and maintain green color. Slice into 1″ pieces and set aside until ready to assemble salad. 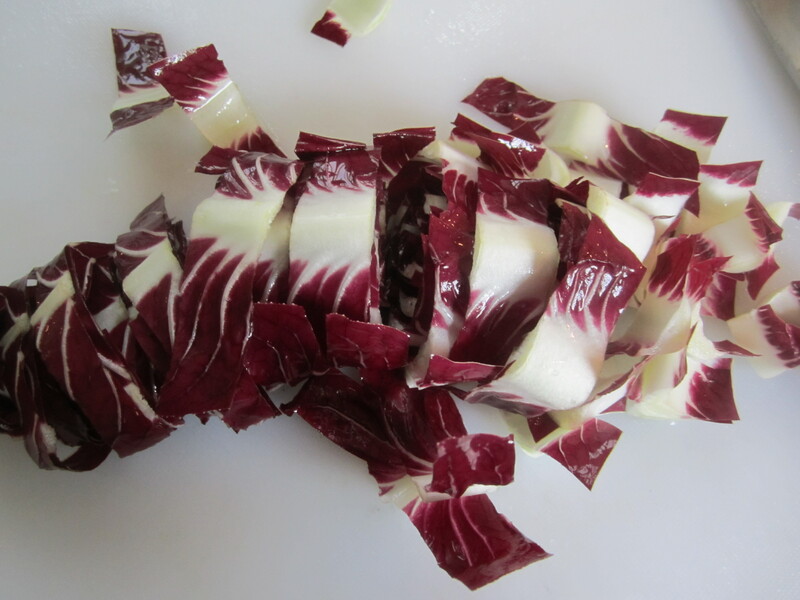 Wash radicchio and slice crosswise into 1″ inch pieces. Set aside. 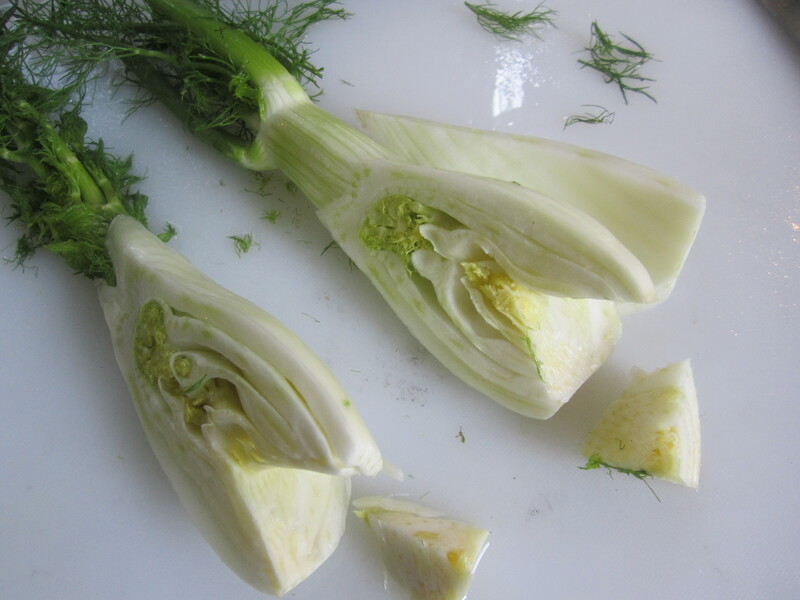 Trim fennel of any fibrous outer layers (sometimes the outer layers comprise 50 percent of the bulb). Cut in half lengthwise and remove triangular section of the core from each half. 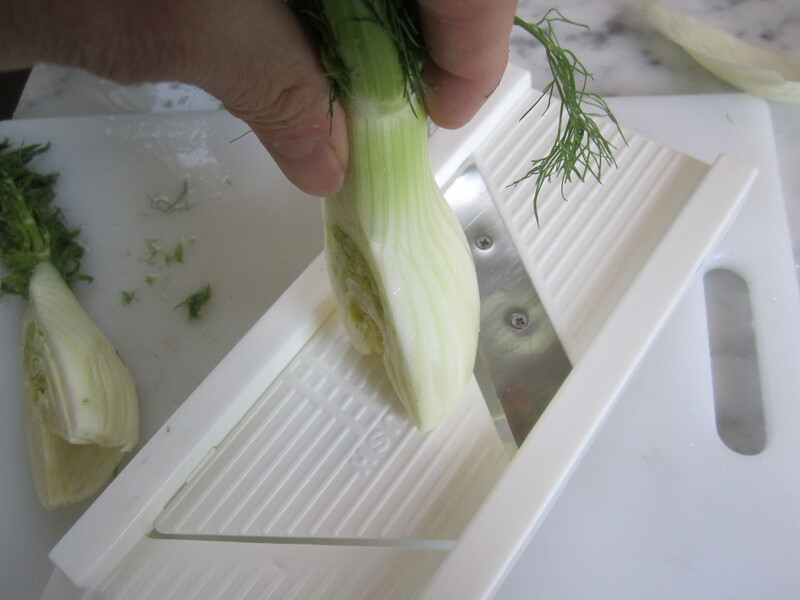 Slice crosswise on mandoline slicer. Place slices in bowl with water and ice cubes and allow to remain in the refrigerator until ready to assemble salad. 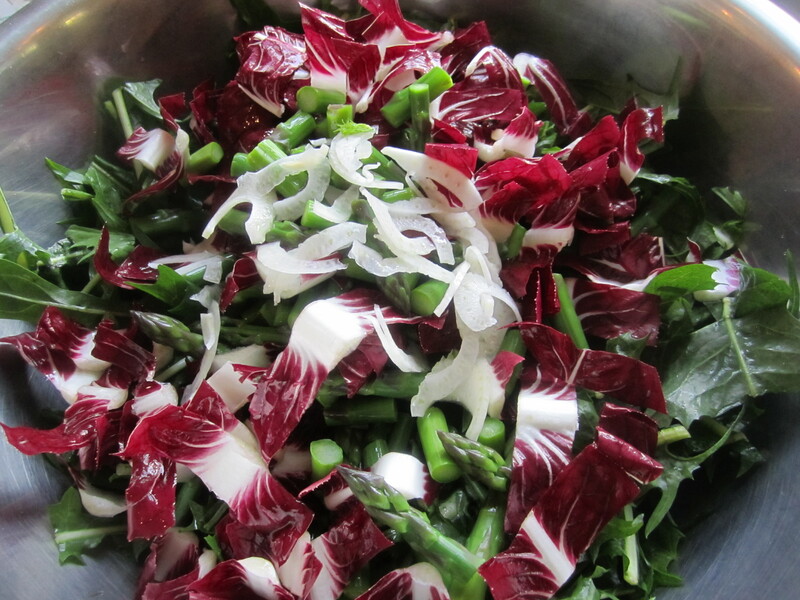 In large mixing bowl, place dandelion, radicchio, fennel and asparagus. Sprinkle lemon juice, oil, salt and pepper over all and mix with tongs. Taste and add salt if necessary. 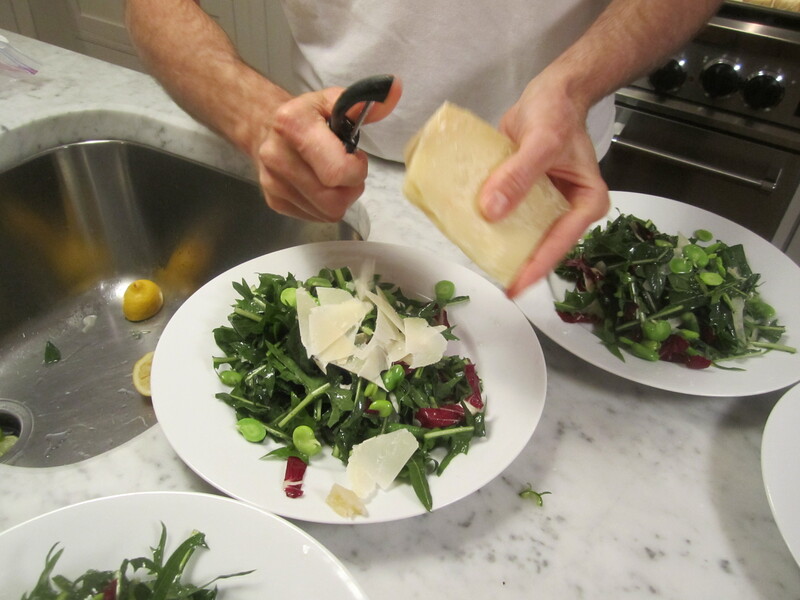 Place a pile on each large plate and with a vegetable peeler, shave a generous amount of pecorino over each salad. Drizzle with a teaspoon of extra-virgin olive oil and serve.